Datamaskinen Din Er Låst Virus is one the latest variant of ransomware infections which has caused a lot trouble to computer users in different countries. 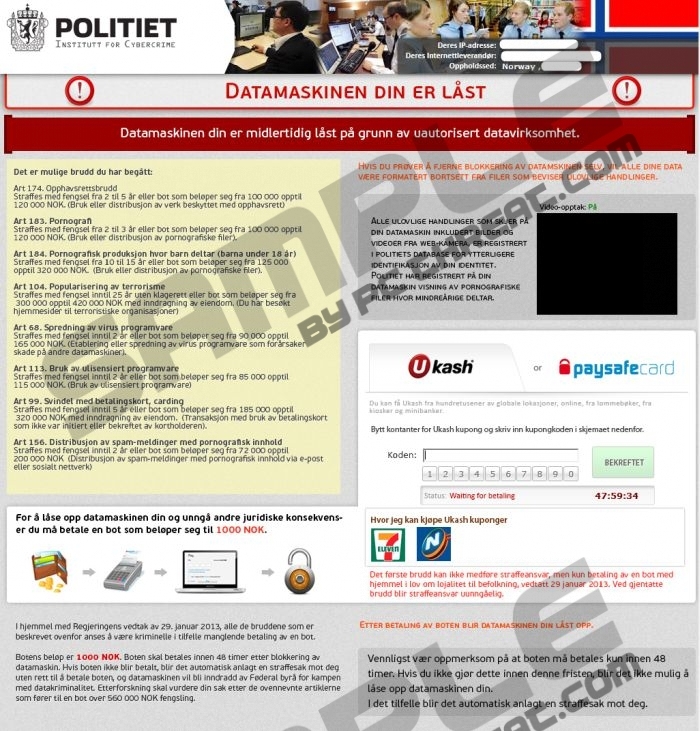 The infection, which gets to the PC as the Reveton Trojan and alters the Registry so that you cannot use the machine, displays a bogus warning which contains the logo of the police in Norway (Politi) in order to convince you that the warning has been initiated by law enforcement. One more institution found in the message of Datamaskinen Din Er Låst Virus is European Cybercrime Centre (EC3), whose logo is also present in the messages displayed by the Urausy Trojan. Moreover, some trustworthy trademarks such AVG Anti-Virus, ESET, and others are added to the warning to convince you that you should treat the warning seriously. The truth is that Datamaskinen Din Er Låst Virus is a scam. Its purpose is to make you pay a 1000 krone fine via Ukash or Paysafecard. The same tactic of deception is employed by the threat called ICE The ICE Cyber Crime Center and such ransomware viruses as Politie Nederland Virus, Politiet Norge Virus and many others. None of the legal institutions or organizations presented in the warnings is related to its production, so do not pay attention to false accusations, some of which are presented below, and remove Datamaskinen Din Er Låst Virus. You can easily remove Datamaskinen Din Er Låst Virus using SpyHunter which is a professional spyware removal tool. All that you need to do is install the application with the help of our instructions given below and scan the PC to have the threat removed. Tap the F8 key as soon as the BIOS screen disappears to access the boot options menu. Using the arrow keys, select Safe Mode with Networking. Go to http://www.pcthreat.com/download-sph to download SpyHunter. Start tapping the F8 key once the BIOS startup screen disappears. Select Safe Mode with Networking using the arrow keys and hit Enter. When the dialog box pops up, click on Yes. Type “msconfig” in the Open box and press OK. Under the Startup tab, click on the Disable All button and select Apply. Restart the PC and let it load normally. Run the installer and remove Datamaskinen Din Er Låst Virus. Quick & tested solution for Datamaskinen Din Er Låst Virus removal. I'm using Vista. When I reboot in SAFE MODE with networking and enter the p*****word, the computer shuts down and restart automatically in normal mode. I've tried reboot in SAFE MODE and SAFE Mode with command prompt. The same outcome. Your only left option is to us SAFE MODE with command prompt. After it loads a black window, enter "explorer.exe". I see that you allready tried command prompt. But does it really reboot in that too?